Posted By:Unknown | At:10:57 AM Be the first to comment! NEW YORK (AP) — India.Arie is laughing off talk that she may have lightened her skin. The R&B songstress is known for singing about being authentic and celebrating one’s true self. But some accused India.Arie of lightening her skin when a publicity photo for her song “Cocoa Butter” released this week made it look as though she were several shades lighter than her dark brown complexion. She added that she’d like to keep the conversation going, though, on the issue of racism and colorism in the black community. Click here to read her Twitter comments. 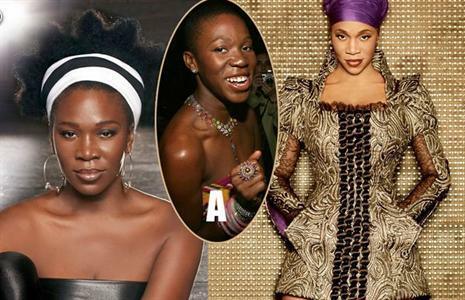 I love India Arie, God knows I do, but that picture is very suspect and I can understand why people are upset. I understand there is a lot that can be done with lightening and the like, but as an artist you still should want the work to represent your vision especially if you are an artist such as India Arie. I expect something like this from other artists out in the mainstream, but not someone from the likes of an India Arie. I will continue to support her and her music. I think she should just use this moment as a learning lesson and keep it moving. She still remains as one of the most talented and underappreciated artists in the game as far as I am concerned. I was just jamming to 'Acoustic Soul' the other day.